Well, for quite a while white bouquets were out. Now they are back and better than ever. Consider using roses, gardenias, and calla lilies for a traditional style or orchids, hyacinth, and cattleya for something more exotic. White freesia is very fragrant as is jasmine. Adding a little pop of color as in the bouquet below adds texture and depth. Big bouquets of big flowers are back. We are seeing lots of large bouquets of one type of flower massed into an extravagant look. Your best bets are masses of peonies, hybrid Catalaya orchids, and mini calla lilies in cream or colors like apricot. Also try cymbidium orchids, or any rose, along with the stunning European fringed roses. These are simply smashing because even when fresh they have the look of an opened rose. Use ribbons to make a big statement. The wider the ribbon, the better, in fact! Make sure to use a great quality ribbon for your bridal bouquet because all eyes will be on you! Polka dots or patterned ribbon to pick up or set a theme, sheer organza, embroidered ribbons, lush satins and combinations of these will certainly make a simple bouquet more lavish and stylish, too. Using a scrap of lace from your mother or grandmother's gown along with a satin backed ribbon is a beautiful, sentimental detail. Bold colors are really popular right now. Many brides are foregoing the iconic white bouquet and blooms and opting for striking masses of blazing color. Feathers? Yes, feathers! We are seeing lots of pheasant feathers in bridal bouquets. They add an exotic touch to a typical bouquet. Rather than the traditional garter or hankie, stylish brides are more creative than ever when it comes to something blue. Why not an all blue bouquet? 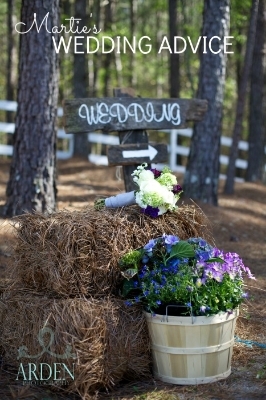 Hydrangea, delphinium, bluebells, grape hyacinth and blue iris are perfect hues of blue for your own signature bouquet. This trend isn’t exactly new, but it is making a comeback. 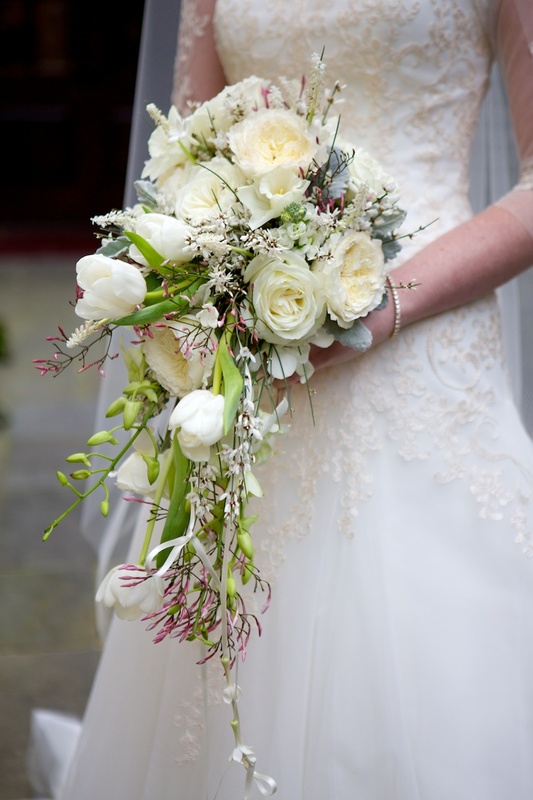 Three or four mini-bouquets are composed into one large bouquet that the bride can break into parts to give to those closest to her so that all may have a keepsake from the day. Instead of the traditional single rose presentation to each mother or grandmother, why not breakaway a small nosegay that each can have preserved as a keepsake after the wedding? We love the way our designers are using pearls, beads and jewels to accent their floral creations. A strand of glass beads can add elegance to a simple arrangement and sprays of beads add a hint of sparkle. A collar of big leafy greens to surround your delicate blooms will show them off to their best advantage. Use tulip leaves or another long, slim leaf and gather them into ribbon-like loops and nestle the bouquet inside. Again, bigger is better. Large leaves, like hostas or galax, really make a bold statement. Lately, we have seen beautiful pearl or beaded floral collars that can be passed down from bride to bride, too. These collars have an antique look and feel. We have seen woven pearls, beaded handles, silver holders and silver collars that are not only stunning, but a beautiful keepsake. Ask your florist for ideas. Right now, letting bridesmaids select their own style gown is very big. Brides select the designer, the color and the fabric and let the bridesmaid select the gown style that she feels most confident wearing. Why not carry that theme over to the bouquets? Select a different coordinating flower from the bridal bouquet for each attendant’s bouquet using a common element to tie all of them together.